Recently, UHN’s Interim President and CEO Justine Jackson got an in-depth tour of the clinical laboratory space of the Laboratory Medicine Program at the University Health Network. Led by members of the Laboratory Medicine senior team, including Dr. Sylvia Asa, Brad Davis, Tom Clancy, Laurie Mason, Sally Balmer, Jacquie Beal, Maria Amenta and Chris Cursio, Justine visited some of our lab spaces on the 11th, 3rd, 2nd and Ground floor of Toronto General Hospital. Highlights in Anatomic Pathology included checking out the viewing area of our autopsy area and speaking with Lester McDonald, a Pathologist’s Assistant, in surgical pathology who was preparing a tumour that had recently removed from a patient. Justine also spoke with Sally, who manages UHN’s Blood Transfusion laboratory about the sheer volume of units that are transfused for our patients every day and our close and important relationship with Canadian Blood Services and our partner hospitals. In speaking with Maria and Chris, Justine also learned the role LMP plays in consult and oversight with hospitals throughout the province in terms of quality assurance, validation and training. Justine also spent some time in our Diagnostic Test Centre on the Ground floor of TGH to get a sense of the “face” of the lab and the role of phlebotimists who collect the blood for testing. 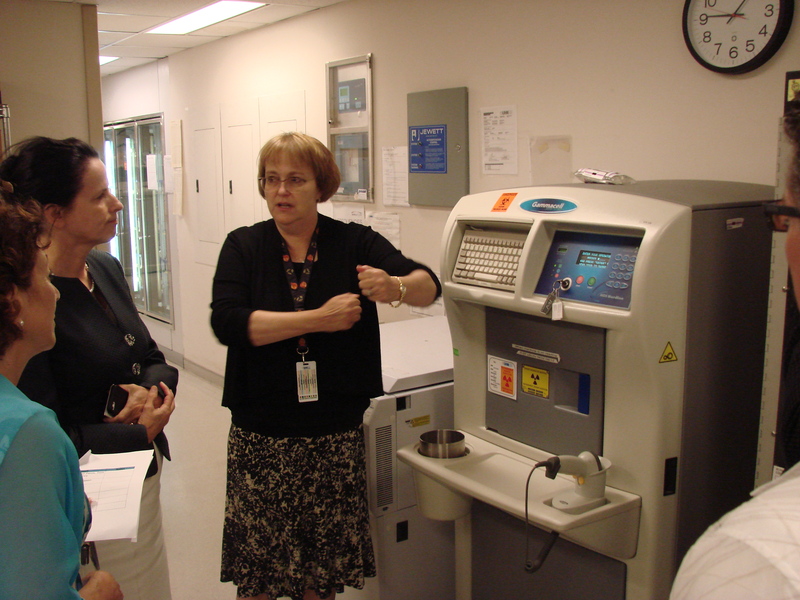 A common theme throughout the tour was the value and role of “knowledge” in our world of laboratory medicine. The speed, efficiency and breadth of much of the high-tech equipment and systems in our labs is impressive and helps us handle the sheer volume of tests we complete every day. But, the knowledge of our staff and the team is really what stands out on a tour of LMP. Seeing, first hand, the value of laboratory professionals in patient care and appreciating that it is their expertise, their training and experience that provides a more robust, comprehensive and complete diagnosis for the patient is really what makes the Laboratory Medicine Program shine.